Looking for diverse perspectives to explain the profound economic and social transformations taking place in Latin America? Real World Latin America brings together the best recent reporting on the region from Dollars & Sense and NACLA Report on the Americas. 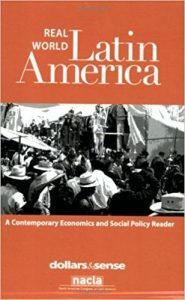 Thirty-eight well-researched and clearly-written articles will give students a thorough introduction to Latin American economic policies, including the region’s changing political maps, the hidden costs of development, struggles for human rights, international trade deals, and the role of the United States in the region. Chapters on social movements and alternative forms of production document the grassroots challenges to the Washington Consensus that are rising from Argentine factory shop-floors, Venezuelan cooperatives, Oaxacan schoolrooms, and elsewhere. Further chapters look at the impact of migration on home countries and diasporan communities, and the challenges of responsible environmental stewardship.